Signatures in email are a common way of communicating information about your business. You can add your mailing address, phone numbers, and even a logo. This is a great way to bring more visibility to your brand. Adding a signature is easy to do and it only takes a few minutes to set up. It’s also something that we get asked about regularly so I wrote up this quick guide to walk you through it. First, open Outlook and click New Message to start composing a new message. I am using Outlook 2016 but the steps haven’t changed much since 2010. Look at the top ribbon and click on Signature. Any signature you have created will appear here. Clicking on Gtech2 would add my current signature to this email. 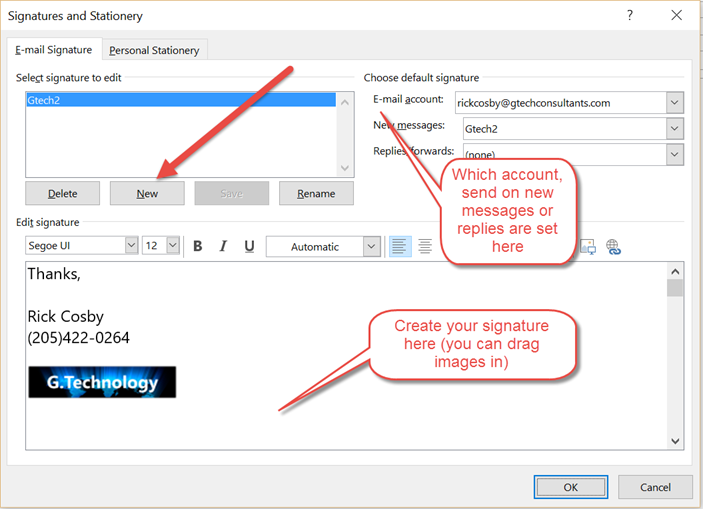 Clicking on Signatures at the bottom, however, brings up the Signature Editor. This is where you create your signatures. You can type in text, choose fonts, and drag and drop images into your signature to get just the look you want. Once you have it looking the way you want, take a look at the settings in the upper right. This is where you choose the associated account. Yes, you can have several and assign them to different accounts if you use multiple accounts. You can also have a more casual one and a formal one. You can also choose whether or not to use it on all messages, just newly created ones, or just replies. It’s common to not add a full signature in a reply as it can clutter up the thread.